If you are someone who checks out my website regularly you'll probably be aware that Marc Jacobs has become a name that I enjoy pronouncing. I am not going to lie but I am a sucker for a great product design. 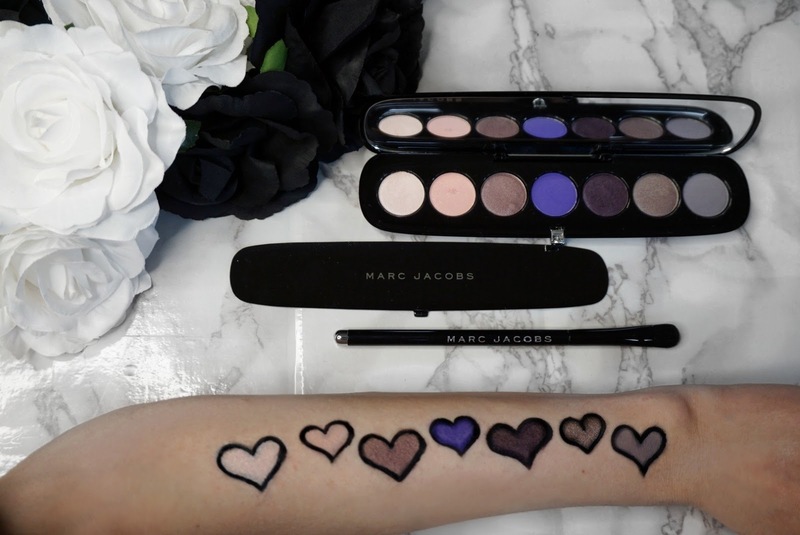 When it comes to Marc jacobs Beauty not only do they design great high quality casing for their product line but they also have very avant garde makeup pigments. 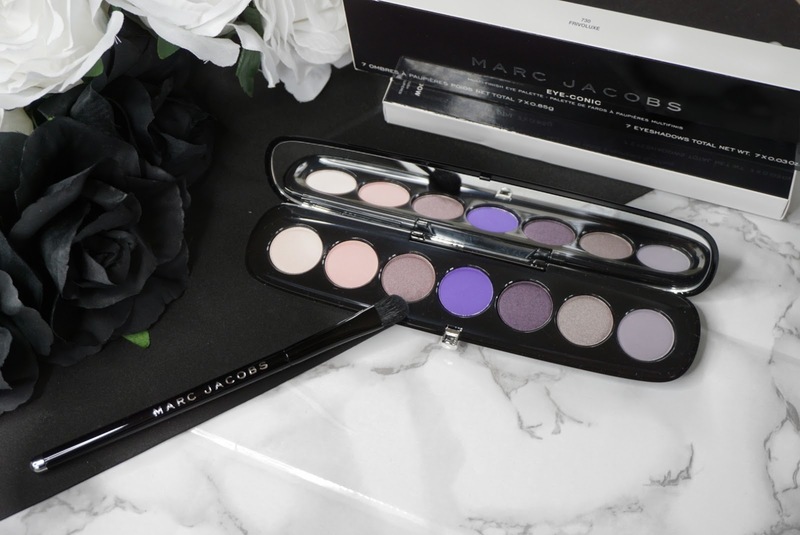 The palette also comes with a sample of their Marc Jacobs Beauty INVISIBLE UNDER(COVER) primer. I have reviewed this primer as part of my Marc Jacobs Makeover experience. It wouldn't be fair if I reviewed the product without using the corresponding eye primer. 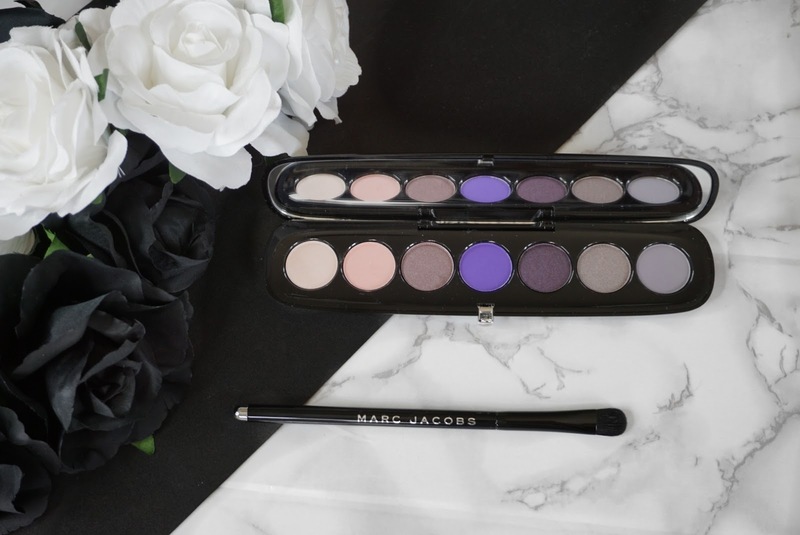 The palette comes as a sleek black high quality compact which is thin and around 20cm in length. The mirror is great for doing your makeup on the go. 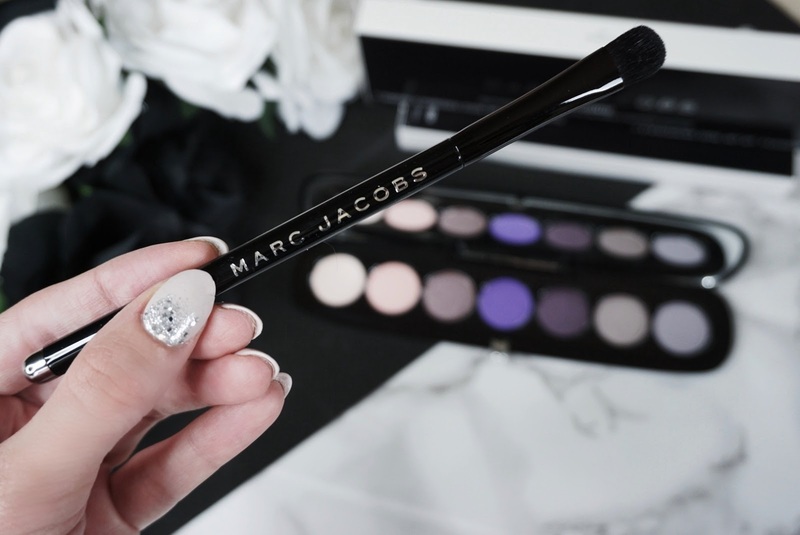 The palette is secured by a metallic magnetic that clicks closure in place so that product is not affected. Theres nothing I hate more than cheap packaging and this is the brand I truly adore for their innovative designs. There are 7 pigments in this palette. At first glance, my attention was drawn directly to that violet colour which had me hypnotised. Many of us are on the look out for efficient purple shade palettes which are so difficult to come by as purples are shades which are hard to produce. The colours include greys, light peach, mauve, purple, taupe and violet. I have not come across palettes with this colour range and as intense as what they appear. Prior to creating a look swatches come in handy to get an idea how the pigment appears on the skin. However this is not indicative of how they will perfom on the eyelid. This colour is a pearl sheen with a pink undertone. It did on first impression appear as a very light coverage shade of a powdery nature. It is buidable so the colour becomes intense upon layering it. I love it's smooth consistency. 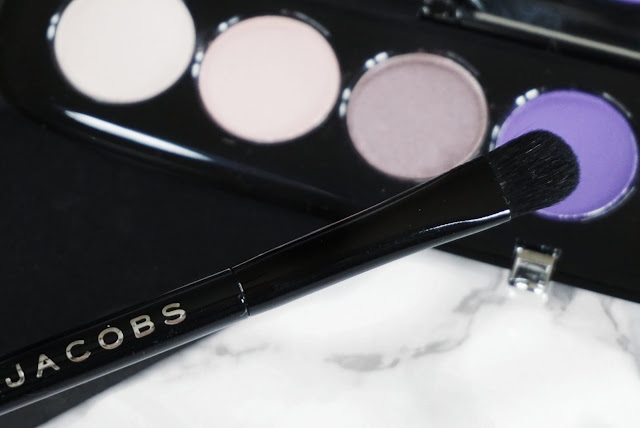 It is very long lasting and found it to be a great shade to use not only on the lid but also to highlight the brow bone and the inner corners of the eye. This was a incredibly sheer and light peachy pink with a hind of sparkle. It did have a satin finish. Unfortunately with this shade you do need to build it up quite a bit to get that peachy pink to show up, but at least it did build to a light shade. I used this shade as the first shade to blend all over the eyelid as a base. However, I can see my self using this shade on those days that I go for a very natural but not bare eye. This shade is an intense dark plum and appears to have a shine to it. It is highly pigmented and applied wonderfully. It is creamy and silky smooth pigment which applies very easily. I did find it a little powdery so bear that in mind. I loved how easy it is to work with. I would used this on the crease or outer edge of the lower lashes. It is a long lasting shade. This was my favourite shade in terms of colour choice. It is that INTENSE POP of colour I love. It is a violet purple with a matte finish and cooler undertones. It is a very soft and buttery shade. It did need a little more work to blend out but I found it builded up nicely in the end mainly thats to eyelid primer used. This shade was partially powdery and long lasting too. This is a lovely shade to use on the eyelid to build up a purple smokey eye and beautiful also on the lower lash line. This particular shade has my heart with it and I am willing to blend it out for a bit longer just to enjoy the colour pay-off. This shade is extremely dark purple with a matte finish. It was so smooth and glided onto skin. I couldn't believe how easy it was to work it. This was the only shade which had quite a fair amount of fallout. As per the other shades besides being incredibly pigmented it also appeared to be very long-lasting. I would use this for a smokey eye either on the eye crease or the outer lower lash. This shade is so beautiful and has this wonderful mauve colour with a slight metallic finish. Again as per standard was very smooth and easy to work with. I did find it was highly pigmented and long lasting. Such a wonderful shade that can be used in all the ways possible. This shade is a grey with a slight purple undertone. This was very smooth and pigmented. It was easily buildable and long-lasting. I have never worked with greys unless in the silver range but this is an interesting shade to own. 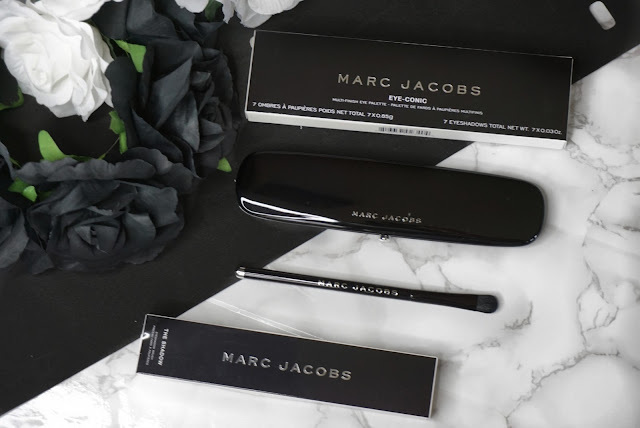 As per all the Marc Jacobs product range it is no surprise that this brush look the part with it's classy shiny black with a silver base. For all those animal lovers you'll be glad to hear this is a synthetic brush. Being synthetic the question remains if whether or not it is able to apply powders with the outmost efficiency and retain product. The answer, oh yes!!!!!!!!!!!!!!!! It retain and lays down the product effortlessly! I compared it to other brands I own and found it was the most efficient one at applying the shadows, which got my head in a spin. I can't stress enough how important eye primer is. A lot of people tend to skip this part. However, I really recommend you to use it as it will allow those pigments to work well, blend well, look crease-free and last longer. The primer felt fresh and wasn't sticky. It did have a slight pigment to it and dried fairly quickly which was nice. I wanted to go for something that is very Marc Jacobs a bold and striking look. Be aware that I am not a makeup artist but rather a Makeup junkie. FABULOUS! → I used on the inner corner of the eye, eye brow bone and half of the lid. ALWAYS → I used on the base of the eye, built it up as a base and blend it out. OUT-RAGEOUSLY → I used it to give the eye that purple intense smoke and used it on the bottom half inner lash line. HOW YOU WANT → I used it to blend it in the crease and give the eye depth. I also used it on the otter half lash line. I enjoyed playing around with this palette and as usual can't get over how beautifully designed their entire makeup line is. It looks so elegant and luxurious. I can't stress enough how important it is for you to use the UNDER(COVER) eyelid primer as it makes it so easy to work with those purple and grey shades. Only then, will you be able to enjoy the benefits of how workable the palette will end up being. I did notice that without the eyelid primer I found it much harder to blend out the product especially with that OUT-RAGEOUSLY violet pigment. I think this primer in conjunction to the palette is a must!!!!! DRESS, HOW YOU WANT and WHO HAS TIME were the easiest to work with and blended out effortlessly. I did love the shades FABULOUS! , OUT-RAGEOUSLY and HOW YOU WANT. Those colours are my cup of tea. The brush is really worth the purchase. I found it incredibly easy to apply the shadow with this specific brush. It is also very easy to clean and the bristles do not shed. All in all, it is a lovely palette that allows the creation of daring looks which are not for the faint hearted. It is very much on the lines of Marc Jacobs catwalk makeup. I enjoyed creating this look. What did you think of the look I created? I would love to know your thoughts below in the comment section. "I received these products complimentary from Marc Jacobs Beauty for testing purposes." However all opinions are truthful and my own.